Discovering this fragment of D.H. Lawrence's poem 'The Ship of Death' in Grayson Perry's The Tomb Of The Unknown Craftsman at the British Museum reminded me of the importance of the metaphorical power of science fiction. Something so often forgotten, these days, when too often it's mistaken for a literal report on the future. In just three sentences, M. John Harrison nails what science fiction is really all about. 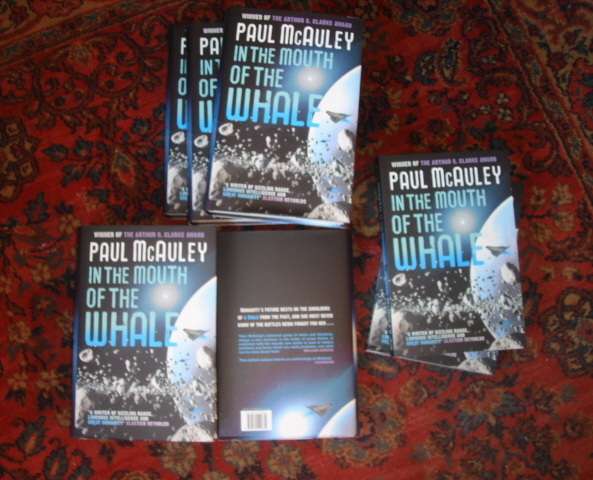 The author's copies of In the Mouth of The Whale. 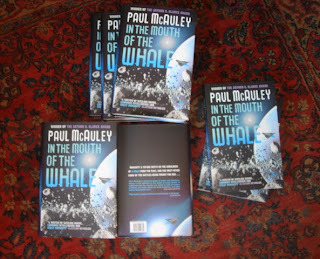 Always strange and exciting to hold in your hands proof that something that started out in your head has become a mass-produced object, out there in the world. I like the cover even more now I realise that there's an image on the back, too. Sidonie Beresford-Browne, who also did the covers for The Quiet War and Gardens of the Sun, has done a great job. ﻿‘Let me tell you about a dream I had when I was about your age. I dreamed that I had entered a great white city, and I knew, in the dream, that I had also travelled into the future, although I cannot tell you how I knew. Perhaps because such cities were sometimes represented in popular fiction about the future, although the one into which I walked in my dream was much more detailed than any picture of imaginary cities. There were many tall buildings, all built of white stone and fretted with row upon row of windows. Some cylindrical and buttressed with fins, like the dreams of the first spaceships before the first spaceships were built. Some narrow rectangles. Some square in profile. Some tapering to points. Clad in differently textured and decorated stone, but all white in the bland sunlight. They stood in clusters and at their feet were smaller buildings. All again built of white stone. Elevated roadways and monorail lines ran past the buildings or looped around them at different levels. There were open spaces, but they contained only white gravel and stone fountains, and statues of people in heroic and noble poses. No trees, no growing things of any kind, and no decoration or signs. In the time when I lived, cities were full of signs advertising all kinds of goods and services. Here, the buildings were blank canvases and the everyday life of the city was unreadable. 'In some dreams, you are a bodiless viewpoint able to transition from one place to another. People in the dream talk with you as if you were one of them, but you have no sense of your body. You are an observer. That was not the case in this dream. I was aware of every footstep, and the people who inhabited the city looked at me as I passed. Perhaps because I was dressed as I would be dressed in waking life, which to them must have seemed as strange and antique as a man in a suit of armour walking up Broadway. The citizens of the city were men and women who were each different and each similar, in the way of members of the same family look alike. They had brown skin and black hair cut short in various styles, and wore long shirts over loose trousers in combinations of pastel colours. There were no children. In my day birds nested on ledges of buildings as if on cliffs, and people kept certain kinds of animals as pets. There were no animals that I could see. Only adults of varying ages. There were many of them, but the walkways and monorail trains were not crowded because the city was so large.